Mark your calendar for Cyber Monday! 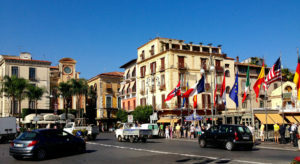 Perillo’s Learning Journeys has an incredible special for Valentine’s Day Live Like a Local in Sorrento: Land and Air, February 10 to 17, 2019. There is limited availability for this 8-day/6-night adventure. The Amalfi Coast is one of those places that alluringly draws one into its charm and romance. It doesn’t get more romantic than the beautiful city of Sorrento – sipping fine wines, enjoying exquisite foods and immersing yourself in rich Italian culture. *Must be booked on Monday, November 26, 2018 between 6 a.m. and 11:59 p.m. The booking link on the will be activated on November 26. No deviations allowed. Package must be paid for in full at time of booking and is non-refundable. This is an online special so we would prefer you book online but you may also call Learning Journeys at 888-884-8259 on Cyber Monday for assistance.